Have a great day ahead, always~ Cheers!! Thank you for the kind words, so thoughtful and tender hearted of you. I’m deeply touched. Just like you, I try to inspire and be inspired here and there. We do our fair share and try to make the world a better place in our own and unique ways. Stay as beautiful inside out as always. You do inspire, you succeed in so many ways! I plan to keep on keeping on. 🙂 I’m going to hug your words to me all day. 🙂 I hope your day is beautiful. Stay happy and peaceful for as often as possible! Work on the new movie starts today. Woo-hoo! Inner peace is important to all …. and a worthy award indeed. Thanks for the video! Enjoyed the movie. Thank you for creating it. this is AMAZING! you’ve inspired me to figure out how to do a movie. 🙂 you are so talented in so many ways! Wonderful……thanks. Congratulations too on publishing your fairy tales. I’m a very happy person these days! Thanks for commenting! I’m fine with Po’s method (aka Kung Fu Panda). It took him two movies, though. LOL! Thanks for your comment! A beautiful film, so very well done. 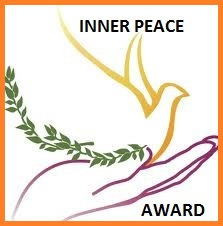 …….. My journey to inner peace? Learning from people I meet on wordpress! My peacefulness has increased as a direct result of WordPress, too! Thanks for your kind words. Your poem, thoughts of sharing inner peace and the movie are all blessings to us. Thank you! You are all blessings to me. I love sharing with my friends! Very peaceful and beautiful movie! Congrats! Thanks!! I’m having a happy giggle that someone likes my movie!! Oh, no! I’ll try to fix it. Nope, just the first movie I ever uploaded to youtube, and probably set something wrong. I hope I’ve fixed it. I’m so happy you like it!! You would not believe what I went through. I had to remake it three times!! The first time it killed my computer. Dead! I tried uploading different versions, different times. Wow. And if you like it, it was all worthwhile!! I can’t imagine how you began to do it. I would have been lost. Now you’ll know what to do for all those other ones you’re going to make. You could have wee fairies in them too. No idea how you would do that but wouldn’t that be awesome, seeing them flit between the flowers? OK, I’m getting a bit carried away. Thanks!! What nice encouragement! And thanks for dropping by. I love your blog, you really make me laugh. I think it’s fixed. If it’s not, can you let me know, and I’ll try something else! Thanks so much for letting me know so fast! !